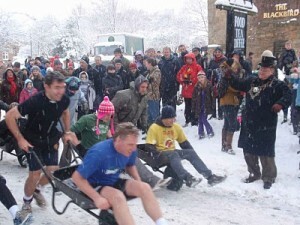 Ponteland’s New Year’s Morning wheelbarrow race has taken place for more years than most residents can remember. 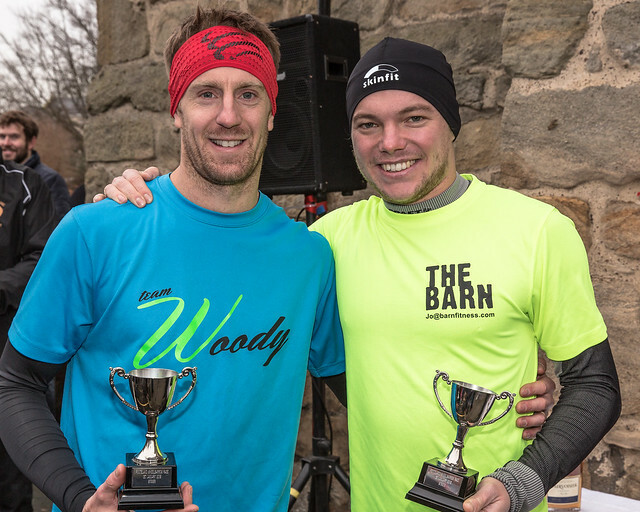 Beginning at 12 noon at the Blackbird Inn in the centre of the village, beside St. Mary’s Parish Church, the race covers a circuitous course of just under a mile with the course record being just under 8 minutes. Each two-person team are required to cover the course, with one member of the team always occupying the wheelbarrow. The tradition is thought to date back to the early 14th Century, when, during a particularly severe winter the Lord of the Manor encouraged local residents to go out and forage in the surrounding countryside to gather what they could in order to help them survive the bitter winter. The event was originally commemorated by local residents, but is now organised by volunteers from Ponteland 41 Club, who do an excellent job, providing wheelbarrows for the teams of contestants, and helping to marshal this very popular event. Over the years the 41 Club and Ponteland Round Table who previously organised it have raised thousands of pounds for local clubs, organisations and charities. The event is started promptly at Noon by a local celebrity who is appointed as “Lord Mayor of Ponteland” for the day. It is the first event in the Social Calendar of the Ponteland area and is extremely well attended, being the “in place” to be seen by those who have survived the other local tradition of “First Footing”. “First Footing” is another traditional, local Hogmanay custom, where local residents tour the homes of their families, friends and neighbours to “let-in” the New Year with the customary drink and mince pie (or Christmas Cake) in order to wish the best of health, wealth and happiness for the New Year.